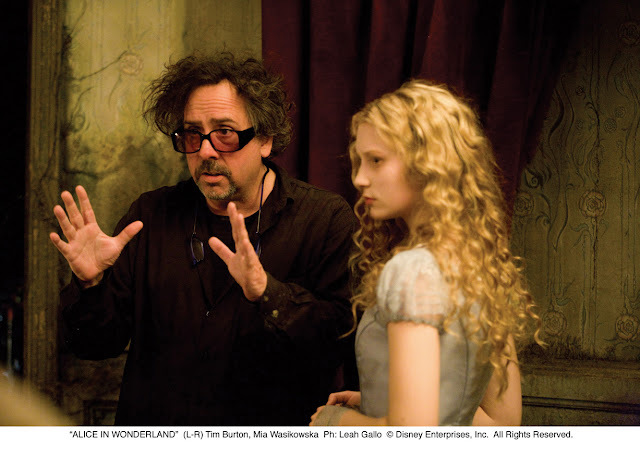 Visionary director Tim Burton (“Charlie and the Chocolate Factory,” “Sweeney Todd”) re-imagines “Alice in Wonderland” into an epic 3D fantasy adventure with a magical and imaginative twist on some of the most beloved stories of all time. 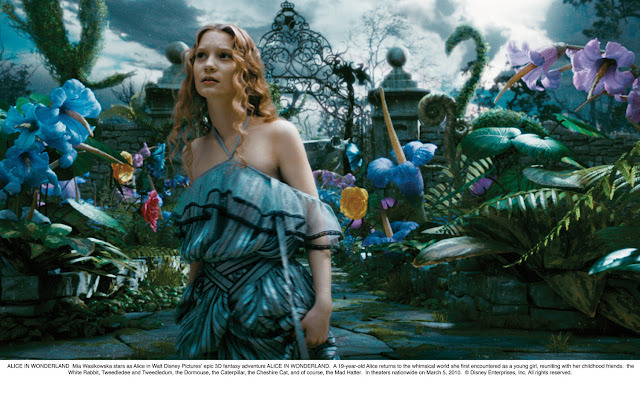 Johnny Depp stars as the Mad Hatter and Mia Wasikowska as 19-year-old Alice, who returns to the whimsical world she first encountered as a young girl. Q: What appeals to you about this story? Tim Burton: In any fairy tale land there is good and bad. What I liked about this is that everything is slightly off, even the good people. That, to me, is something different. Q: When you were first approached to direct, what was your reaction? Burton: They gave me a script and they said 3D. And even before I read it, I thought, that’s intriguing, and what I liked about Linda Woolverton’s script was she made it a story, gave it a shape for a movie that’s not necessarily the book. So all those elements seemed exciting to me. What I liked about this take on the story is Alice is at an age where you’re between a kid and an adult, when you’re crossing over as a person. A lot of young people with old souls aren’t so popular in their own culture and their own time. Alice is somebody who doesn’t quite fit into that Victorian structure and society. She’s more internal. Q: Why did you make Alice 19? Burton: That age just seems to me to be a crossroads. There, I think you’re entering a culture where you’re pressured into society, or getting married, or some other thing. And she just seems to me to be at that point where you’re at an emotional crossroads. I just felt like Alice is an interesting character, because she’s at that age, and she’s got both a young person’s and an old person’s soul. There’s a dynamic—at odds feeling both the young and the old, and then reconciling those two things. And, so, her adventures are her coming to terms with who she is and gaining her personal strength. It seemed like the right age to explore that dynamic of somebody, at a moment of change. Q: What is Johnny Depp’s approach to playing such a vivid character as The Mad Hatter? Burton: It is an iconic character and it’s been portrayed in animation, in live-action. I think Johnny tried to find grounding with the character, something you can feel, as opposed to him just being ‘mad.’ With a lot of versions, it’s just a one-note character, and his goal was to bring out a human side to the strangeness of the character. I’ve worked with him for many years, and he always tries to do something like that, and this time was no exception. Q: How close do you work with Johnny in creating his characters? Burton: Well, I’ll do a little sketch, he’ll do a little sketch. We’ll talk. It always is different. With him, we use references, but they’re never specific references. Because he never wants to feel like he’s doing just one thing. So, we use a lot of abstract references. But I’m always excited to see what’s gonna come out it. Q: Can you talk about why you chose newcomer Mia Wasikowska for Alice? Burton: She has both a young quality and an old quality. Very grounded—some people are just all over the place. But some people, they have that old soul quality. And that’s what we felt was important for this Alice. But, at the same time, to be young—there are people with old souls who are also naïve at the same time. There’s a certain slight passiveness to Alice that’s always in the material. So we wanted to give her more of a quiet strength, which Mia has herself—just as a person. I just liked her quality. I always like it when I sense people have that old-soul quality to them. Because you’re witnessing this whole thing through her eyes, it needed somebody who can subtly portray that. Q: Why did you choose to make the film in 3D? Burton: Well, 3D is not a fad. It’s here to stay. It doesn’t mean that every movie’s going to be made in 3D. But at the same time, “Alice” in 3D, just because of the material, it seemed to fit. So, instead of it just being a given, we tried to treat it as though it was a part of Wonderland. Matching the medium with the material. Q: Does using 3D affect the story? Burton: In the old days you’d put the glasses on and walk out of the theatre with a splitting headache. And that’s no longer the case, it’s a much more pleasant experience. And I’m personally not out to make a gimmick, so I believe that it enhances the film. It puts you into that world. And with the “Alice” material – the growing and shrinking of characters for instance – and the special spaces and places that you’re in, it just helps with the experience. I always ask, ‘Is it the right medium for this?’ and not just do it because it’s a gimmick or it’s fashionable now, and it did feel like it was the right kind of material. So seeing it come to life in 3D supports the material. It gives you that kind of ‘out-there’ feeling that was a very crucial element to the film. 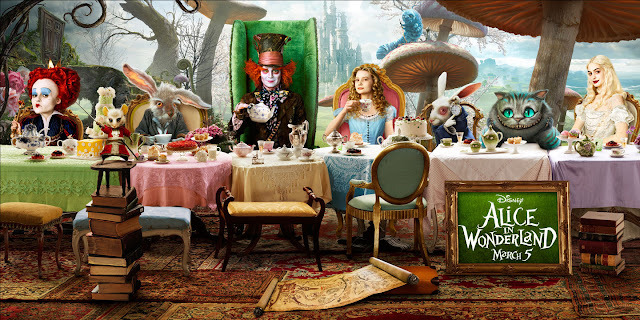 Opening soon across the Philippines, “Alice in Wonderland” is distributed by Walt Disney Studios Motion Pictures International.